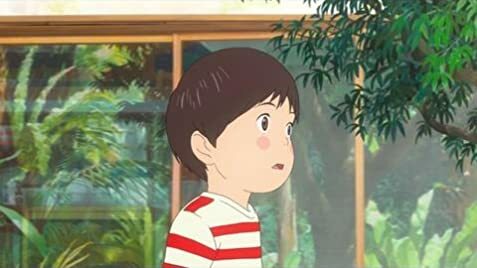 Mamoru Hosoda‘s Mirai no Mirai (未来のミライ) will get a North American home video release on April 9th, 2019 through GKIDs, but I had to see this title on the big screen first! It was this year’s Jammies and Toons selection at the Victoria Film Festival; they often feature an anime. This part of the show is one I’m always there for, and they sometimes promote it as part of Canada’s Family Day celebrations when the dates line up. This work by Studio Chizu is certainly the perfect choice. This movie is jovial and very reassuring in teaching attention-seeking Kun (voiced by Jaden Waldman in the dub and Moka Kamishiraishi in the original) how family matters. Every time he acts up and tries to run away, his world gets turned upside down ala Alice in Wonderland. The Lewis Carroll references are light, but Tick-Tock if the time runs out, he better get the moral of what’s being taught to him Charles Dickens style, lest he gets forgotten. His parents are generally forgiving, but sometimes they feel too exasperated. One reason why this four-year-old boy is testy is that he now has a baby sister, Mirai. All that love and affection is transferred to the newest member of the family. Hosoda wrote this story and most of his works focuses on those moments which defines a loving family. There were sequences familiar enough which had me wondering if he’s drawing from My Neighbour Totoro. An important image which frequently crops up is a mystical tree. This film takes on a feel of a mythic journey. Its approach is very much inspired by A Christmas Carol, but I feel there’s a good splash of Meet the Robinsons mixed in. As for whether all of it was real or imagined by Kun, this film never says. The Japanese Shinto religion plays an important part in the story as it concerns connecting different points in time together. When Mirai is introduced, all seems good until Hinamatsuri–a seasonal festival–kicks in. For a short period of time, a male and female doll is displayed to honour prosperity for the royal couple. When they are not put away, superstition says the young lady of the house will not marry right away. Interestingly, the film says the number of days left out is proportional to the years left out–perhaps a regional variation. Kun’s hero’s journey lasts for several days and happens as soon as the statues are put out. He meets his sister from the future, hence this film’s title, and from there, the craziness does not end. He even meets an anthropomorphized version of the family dog! None of these is given explanations in-film, but I suspect the tree has something to do with it. It’s often symbolic of life. The family tree is also explored as the child learns about how similar his mom and dad was when he was young. Meeting a few other members of the family is also offered, but there’s more to this film than him learning from his grandpappy. In Japan, the cherry blossom tree is a metaphor for human existence. It is also linked to Buddhist beliefs concerning mortality, mindfulness and living in the present (1), all apt concerns especially when all those fantasy moments or transitions to take place near the tree in Kun’s family abode. It will be there to see the children grow, and through it, can transport Mirai anywhere. No, she is no meta-human. She’s normal like everybody else. In addition to the life-lessons the kid has to experience, she offers through compassion to help the bratty Kun, quite literally, grow-up. ← A Silent Voice to Make Itself Heard April 2, 2019!